Earlier this year, URX was a relatively unknown startup — a small team with a very technical product. That changed this spring when it announced a $12 million Series A and landed a series of glowing profiles from TechCrunch, The Wall Street Journal and others. Today, the company is quickly becoming synonymous with a new trend and term —deeplinking— the ability to link users to any page inside an app (vital as more people use their phones and tablets for everything they do). Since then, the team has expanded to close to 20 employees, and is on the brink of a breakout growth. But what keeps CEO John Milinovich up at night? Making sure URX’s internal communications are designed to help it become a better company as it scales. The tech industry is littered with examples of communication breakdowns that stunted promising starts. Suddenly things got too big, people didn’t know what was going on, and products suffered. Milinovich is determined to dodge this bullet. To fix things before they break, he’s been meeting with his backers and mentors — experienced entrepreneurs themselves — to figure out how to keep communication flowing. His contention: If people can focus on self-improvement, companies can too. And he’s deployed four strategies to make this happen at URX as it grows. From the beginning, John and his co-founders have prioritized hiring people who are uniquely open to giving and receiving feedback. It’s something they try hard to suss out in the interview process by building in opportunities to provide critique, dive into the product, be controversial. They want to see who will be critical of their work, and who will accept criticism constructively. But they needed a forum for the company as a whole to do the same. Everyone was working so fast without a break, there was no time to reflect on what was going right and wrong. Contrarian Office Hours have been used to tackle everything from whether URX should work with a specific customer to equity packages and benefits to vacation policies. Allowing people to step out into the open and talk about how they feel has both helped them bond and accept ownership over the company. “We tell our employees to check their egos at the door, so as a company we need to do the same thing,” Milinovich says. Part of the deal is that URX’s leadership will take whatever’s thrown at them and meaningfully respond (even if it requires extra research or a product change). The session is time-bounded to an hour, so that people with questions or opinions are encouraged to share upfront, and people with answers are incentivized to fix issues swiftly if they can or take more complicated matters offline. The leadership team actually collects questions and topics in advance using Google Moderator so that they can prepare genuine, thorough answers, and also budget how the time will be used. “If we know we have 10 questions, we’ll pay attention to handling each in five or six minutes,” Milinovich says. Also critical, Contrarian sessions end by celebrating victories large and small. Milinovich quickly realized how necessary this was to end the week on a positive, energizing note. No matter how negative the preceding hour can get, this gives people a chance to share personal wins, congratulate their colleagues, and recognize good work. Stacking criticism and priase so closely together has had a compound effect, he says: It has made transparency rewarding. One core tenet at URX is lifelong learning. The idea is to create a company that is greater than the sum of its parts by combining knowledge, and using it to motivate people to extend their individual capabilities. Several times a week, usually over lunch, the entire team is invited to what they call Tech Talks. These are always taught by another member of the team, and can be about something related to a project they are working on, a demo, or simply a relevant topic they find interesting. In the last two weeks alone, talks have included an intro to Python, a demo using Google Glass, and discussion on finding early adopters based on Crossing the Chasm. Even though these talks are completely optional, Milinovich says the format has encouraged healthy attendance. One of the more inspiring facets of this tactic is seeing the people you work with double as teachers. Many are willing to put the time into preparing materials to discuss, and are very patient when describing topics they know like the back of their hand to people who are less familiar. For people who work in a very specific functional area, the ability to present, teach and mentor gives them an extra set of tools they can apply in their careers, either at URX or down the line. These discussions also foster communication between the engineering and business sides of the company. There aren’t as many opportunities for these people to interact on work projects, so talks represent one of few times they’re all in the same room engaged in the same topic. Having a broad view of challenges across the company yields an interesting perspective on how the technology, the product, and the sales process come together to delight and serve customers. In many cases, questions get asked that surface new ideas for the company. This manifests in the form of one-on-ones. 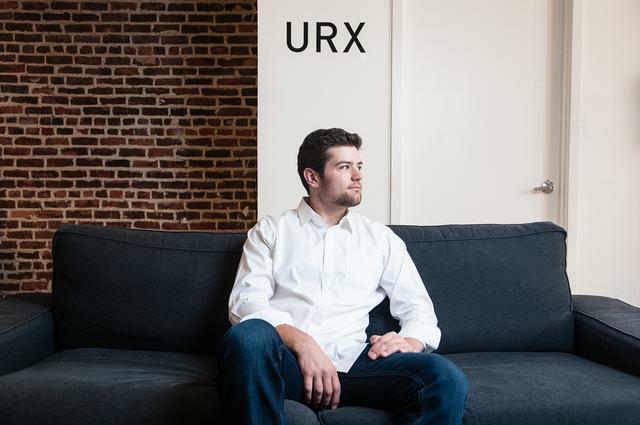 He has one scheduled with every single person working at the company — everyone — and he’s committed to keeping it this way for the foreseeable future, even if and when URX surpasses 100 employees. It might take some creative calendaring, but it will remain a core value for him and the organization, he says. In addition to meeting with Milinovich, every member of URX’s technical team also spends one-on-one time with CTO and Co-founder Andrew Look. Right now, this happens bi-weekly, with Milinovich meeting with every member of the business team on a weekly basis. The best way to get people to open up is to model the behavior yourself, Milinovich says. He’s made a point of being extremely open and honest about his own life, problems he’s facing, and concerns he has about the business, no matter where someone ranks in the organization. “I will definitely continue to meet with everybody.” Bold words, but he has a plan for staggering meetings as the company grows. Depending on how closely he works with people, or how relevant he is to their work, he’ll meet with people weekly, then bi-weekly, then monthly, then quarterly. It may take some master-level scheduling, but it’s a high enough priority to invest the time, he says. On top of that, he won’t require one-on-ones if there really is nothing to discuss, which will also save time. “People will have the most consistent relationship with their manager, but can always reserve the option to speak with me if they want, and I will make time,” he says. It started with a five-page essay written by Andrew on all of the product changes that have been made since the beginning of the company to date. Not only does it enumerate all of the shifts in the product, it also includes the reasoning and rationale behind them in case people wonder why choices were made. Today, this and many more processes and founding documents live on URX’s wiki, where anyone can access them, comment, or edit. That said, to keep it useful, this central bank of knowledge can’t be a free-for-all. For example, helpful snippets of code may be easier to surface for members of the engineering team, while customer lead lists are more visible for members of the business development team. The architecture will continue to evolve as the company gains momentum, but these principles will stay the same, Milinovich says. URX uses GitHub to run its wiki, which allows the team to not only present current information, but also all the iterations that came before that, so that if someone really wants to dive deep into the evolution of the company and the product, they can trace their steps through time. This project is a significant part of Milinovich’s job day to day —about 10 to 20% of his time is spent writing things down — that’s how important it is to the health of internal communications, he says. The same thing is true for all of the company’s co-founders who specialize in different areas. Milinovich spends a lot of time contemplating tactics for self-improvement and believes that the same can be done on a company level. John Milinovich tweets at @jmilinovich. URX does the same at @urxtech.